When doing arm exercises, it's crucial that you have a good posture, as well as making the right movements. Below, we'll take a look at how you can perfect your bicep curls. The goal is to tone and shape the upper part of your muscles. When you start a training plan, it’s important to go at it step by step. Exercises such as bicep curls, lunges, or squats seem simple but require good techniques. As such, we’ll give you some tips on how you can perfect your bicep curls. Indeed, this movement is ideal for defining and strengthening the front of your arms. You should never forgo good posture to lift heavier weights. In the end, it might only result in slight gains and make your muscles break down. For small muscle groups especially, it’s much better to have good posture than to increase your workout’s intensity. In this article, we’ll take a look at what you can do to perfect your bicep curls. One of the most common reasons to visit a gym is to work on your arms. By using weights, dumbbells, and machines you can tone and gain muscle growth. The biceps and triceps tend to be areas that men and women target the most. Since each person’s muscles are different, they’ll need different machines and weights to sculpt them. As such, a person’s genetics are also a determining factor. So, if you want to sculpt your upper body, weight training at the gym will be your best bet. A workout for these smaller muscles often involves separate exercises. For the front part of your arms, the bicep curl is a crucial exercise. What are biceps and what do they do? 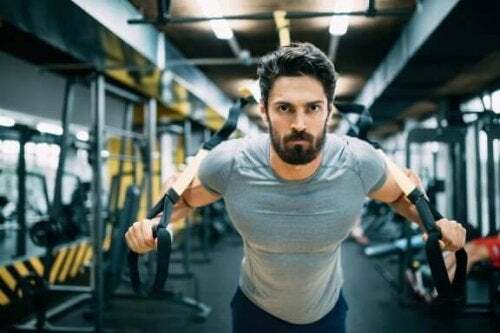 Biceps are a muscle group with two parts: the first is the “short head” and the second is the “long head.” Both play a role in the arms’ mobility between the elbow and its joints. These muscles are responsible for five types of movements: fixed elbow, fixed forearm, free elbow, 90-degree bend, and external shoulder rotation. Bicep exercises should be done with extreme care. Otherwise, injuries such as tendinitis, tearing, or fractures can happen. The bicep curl is one of the most popular gym exercises. Still, though it’s easy to do, it requires special attention which is why it’s important to perfect your bicep curl. What’s more, you should always do it with dumbbells since lifting bars limits your forearms’ range of motion. Before starting a strength training routine, make sure to warm up for 5 to 10 minutes. For example, running or using a treadmill are good options. Also, you should make sure that you stretch. 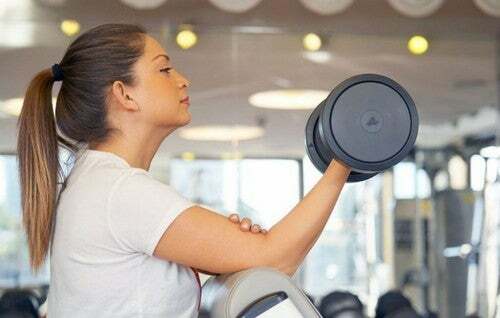 This way, your muscles will be warmed up which can help you to avoid injuries when you start lifting weights. To perform the bicep curl itself, you need to keep an upright posture. Your knees should be slightly bent while making sure you squeeze your abs and glutes. Keeping this in mind will help you engage other parts of your body. Another tip is to increase the weight as you gain experience. You have to increase the weight gradually to prevent your muscles from plateauing. Should you decide to use bars once in a while, it’s a good idea to vary with dumbbells and vice versa. A common beginner’s mistake is forgetting to rotate your wrist when you bring the weight up. In the starting position, you should keep it facing upward, but you have to turn it gradually as you pull the weight up. Also, you should do so before your forearm is parallel to the ground. Another problem is that many people forget to keep their elbows glued to their sides. Doing so makes your whole arm work instead of just your biceps. So, the further your elbows are from your body, the less you’ll be targeting your biceps. As for your shoulders, make sure you avoid swinging them forward. It’s another example of poor posture when doing bicep curls. What’s more, your arms should be perpendicular to the ground. It’s important to avoid swinging your torso since it can cause your shoulders to move in the wrong direction. In conclusion, if you follow these tips and use a trainer’s help, you can effectively perfect your bicep curls. The good news is that you don’t need too much weight to notice visible results. As we’ve mentioned though, with time, you’ll have to up your weights.